I’m having an issue where the notification email is always coming from JotForm. I’ve used the hidden field technique and it’s still the same even though I have the hidden field selected. If I set it to be the senders name that doesn’t work either. No matter what option I chose, it always says it’s coming from JotForm. The site is on Drupal so I’m not sure if the CMS is interfering with the form somehow. The rest of the form works and I have other forms on other sites with the same settings and they work. It’s just this one for some reason. 2. While on the "Setup & Embed" tab, click "Email Alerts"
Please let us know if there's anything else related to your forms with which you require our help. 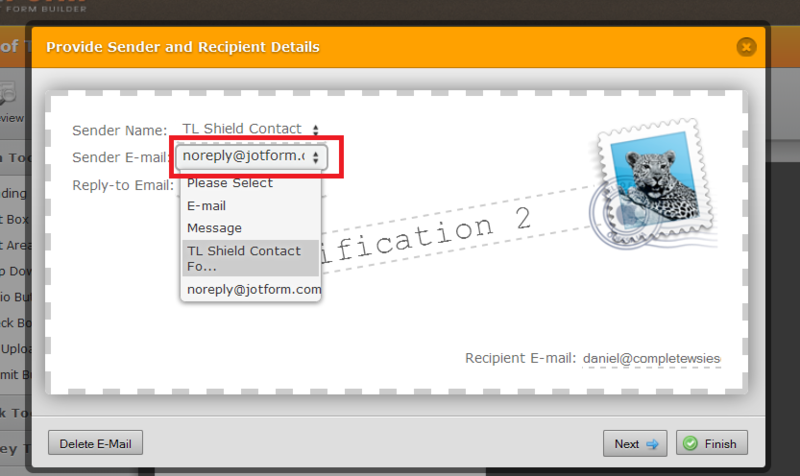 If you want to take out the hidden field from the email submission , you can modify the email template. I followed along your video. But I don't want an email address to show there. I want it to say TL Shield Contact Form. And that's what I put in the default value in the hidden field properties. I’ve done this before with success. But on this I've tried different things. It’s always the same. It just says JotForm. I tried several different settings in there. It always says JotForm. Even when the settings match what is above. Your cloned version is not attached to the website. That's why I'm wondering if something within the site (a drupal site) is interfering. Hi, I have another suggestion though. We can check this further if we all can check the sent email itself. If OK with you, we can do this by having your form Notification email recipient address change to an email account that everyone can check. Please inform us, if this is OK with you. Hi, as adviced by my colleague Jonathan, I have made some tests into my clone of your form, and it worked, so I also made the same changes into your form, please check it . I think I deleted one submission by accident on that dispossable email address inbox, and only left one. At any rate, you should have both , so please verify it in your own inbox.